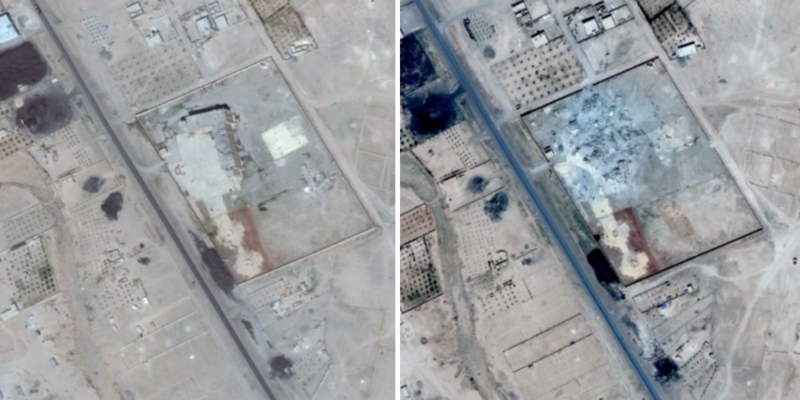 Sattelite imagery of the Al Badiya school, before and after the air strike. In order to commemorate the Al-Badhiya air strike’s second anniversary in which, according to the UN Commission of Inquiry on Syria, 150 civilians lost their lives Airwars and ECCHR organised a panel discussion. The Al-Badhiya strike, the most severe air strike of the anti-IS Coalition with over 150 civilian casualties, took place on the 20th of March 2017, when it hit a shelter for internally displaced people in Al Mansura, Syria. Germany, part of the coalition, acknowledged its role in the strike by providing images of the target site to the coalition command as well as battle damage assessment flights after the attack. The coalition conducted extensive air and artillery strikes during its military operation with the aim of defeating IS in Syria and Iraq. Airwars, a non-profit monitoring organization and partner of ECCHR, has documented 14,424 strikes in Iraq, 19,280 strikes in Syria and has estimated up to 11,841 civilian deaths. The discussion started off with a presentation of research conducted by James Rodehaver from the UN Commission of Inquiry on Syria, Nadim Houry from Human Rights Watch (HRW) and Fadel Abdul Ghany from the Syrian Network on Human Rights (SNHR) into the strike and later opened up a larger discussion with Andreas Schueller from ECCHR, Maike Awater from Airwars and Robert Frau from the University of Potsdam on the legal and transparency implications of such strikes. It was initially pointed out that a dilution of information, mostly caused by lack of transparency and a tighter reliance on collective action, often ends up leading to a dilution of responsibility, whereby it is hard to asses which actor is ultimately accountable for loss of civilian life. All speakers in the first panel mentioned the difficulties related to data gathering and documentation: Houry mentioned the fact that HRW was only able to identify about 40 people who were confirmed to have been in the building during the strike and they did so through an investigation on the ground in July 2017. Rodehaver added that this was much harder for the UN Commission as they were not allowed to travel to Syria, but could only base their calculations on testimonies and remote connections. In addition IS destroyed records of their presence after they were ousted from Raqqah province, making it extremely hard to gather data. This was partially due to a paranoia on the part of IS fighters of being deemed responsible for crimes and a desire to control information and their narrative, but also due to the fact that some of the people within the building may have been family members that IS fighters wished to bury themselves. Abdul Ghany mentioned that in 2017 the Coalition caused more strikes in Syria than Russia, which represents a huge change in the way war in waged in Syria and which changes the narrative that the US government has so far been putting forward, ie. the US Coalition is not one of the most relevant actors in this conflict. Awater mentioned that Airwars had early access to witnesses, videos and photos showing the loss of civilian life, but that official statements denied all civilian harm, claiming that the strike hurt ISIS only. Only about 18 months later, the Coalition acknowledged civilian casualties. Rodehaver pointed out that the largest violations in Syria are due to both detention and irresponsible use of airpower, which puts Coalition members (ie. US, UK, France and Germany) in a difficult position with regard to their involvement in Syria. Frau stated that there needs to be a distinction between the competent authorities from a legal point of view: the Ministry of Defence is responsible for taking all possible precautions to avoid civilian casualties, but that the subsequent investigation into potential war crimes should be made by another authority. Schueller advised that it is fundamental to preserve and respect the law and not the political interest within the law. Frau added that the legal instruments are there already and that no other law is needed to account for such strikes, as they fall in the IHL and IHRL domains. It was remarked that lack of political certainty ends up bleeding into the legal realm, shaking the foundations of the law and making it less stable. The audience asked whether such strikes may end up shifting the narrative and making war from the sky and remote warfare the new form of warfare, which is more acceptable precisely because it is so detached. The speakers agreed that there is such danger. In terms of action points and future recommendations to governments, speakers agreed that transparency is fundamental to obtaining the initial assessments into state behaviour. It was noted that transparency from government often comes at a cost, as it could lead governments who are criticised to reveal less information, in order not to provide further grounds for criticism to watchdogs and civil society groups. However those governments that do self report their behaviour such as Australia, as Awatar pointed out, end up improving it and providing little grounds for criticism. One speaker remarked that having a more advisory role towards governments would help CSOs and interested UN bodies achieve their goals with regard to civilian harm mitigation. Another speaker remarked that lessons learned from Syria would need to be taken into consideration whenever conducting strikes elsewhere: one example to this would be the fact that under IS siege women are not allowed to leave their homes, making it harder for Coalition forces to determine whether there is anyone in a building, despite observation through drones for extended periods of time. This is similar to what happens under Boko Haram siege. Such lesson from Syria could help decision-making on strikes in other circumstances. In addition, another speaker mentioned that a civilian casualty cell should be established before a conflict starts and that there need to be standardised military procedure on tracking civilian casualties, in order to have an organic behaviour amongst Coalition members, making it easier to attribute responsibility and knowing that all members to a Coalition are on the same page when a strike is carried out. Finally, it was pointed out that IS was ousted one year ago from Raqqah, but that the situation with regard to infrastructure, schools and hospitals has not improved and that in order to achieve stabilization, there is a need for states which have been taking part in the conflict and contributing to the destruction of infrastructure to help rebuild.